Bridgewater Beasts Are In Monsters of Massachusetts! You are here: Home / Bridgewater Triangle Beasts Are In Monsters of Massachusetts! Those interested in the new documentary film, The Bridgewater Triangle, will be intrigued to discover new information about that area is included in my newest book. As many of you know, I coined the name for the location and have encouraged others to research, write and make films about it. 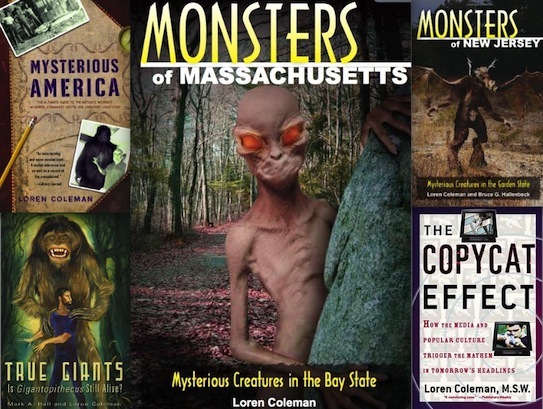 On August 1st, Stackpole Books published Monsters of Massachusetts, and is in the International Cryptozoology Museum. It is available via online booksellers too. Dover Demon ~ Seen for one brief week in April, in Dover, Massachusetts, the little sandpaper-skinned, bright orange creature shook up a town, state, and nation in 1977, beyond its wee size. The impact and weirdness of the Dover Demon lives on today, in its appearance on reality cryptozoology programs, and in comic books, tee shirts, and toys. This book’s update and overview is the most comprehensive yet written about this case. Hockomock Swamp’s Beasties ~ There is no area in New England more bizarre than Massachusetts’ fabled Bridgewater Triangle that overlaps with the Hockomock Swamp. Giant birds, Bigfoot, giant snakes, pookas, and other monsters are said to live in the area. Black Panthers and Tawny Mystery Cats ~ Melanistic or black panthers are not suppose to exist zoologically, but they are the most frequent creatures seen in the woods of western Massachusetts. Described as sleek and silent felids, wildlife biologists, police, and common citizens have been the eyewitnesses. Gloucester Sea Serpent ~ The legacy of the Gulf of Maine’s Great New England Sea Serpents came to ahead in the years 1817-1819, when the huge 60-100 ft ling Gloucester Sea Serpent was seen. Sightings go back to the 1600s, and yet have been recorded as recently as the 21st Century. Specter Moose ~ Giant monster moose roam Massachusetts, and one eyewitness gave the author an exclusive interview about his Bay State encounter. Out-of-place Critters and Other Monsters ~ Massachusetts, having the highest population density in New England, has no shortage of other strange creatures, from werewolf-like critters to Massachusetts’ Giant Frog, from out-of-place species to beached Krakens on Plum Island, Massachusetts, that figured in Dan Brown’s most recent novel. 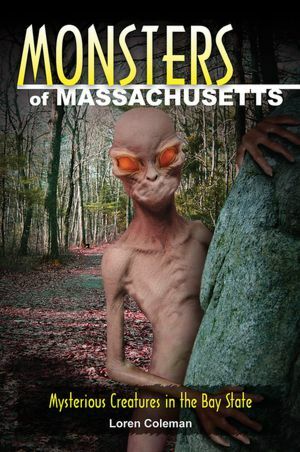 Click on the name, Monsters of Massachusetts, to order the book. Or stop by the International Cryptozoology Museum to pick up a copy, while they are still in stock. They are selling fast. Morning Loren: Do you expect to see it in e-format any time soon?